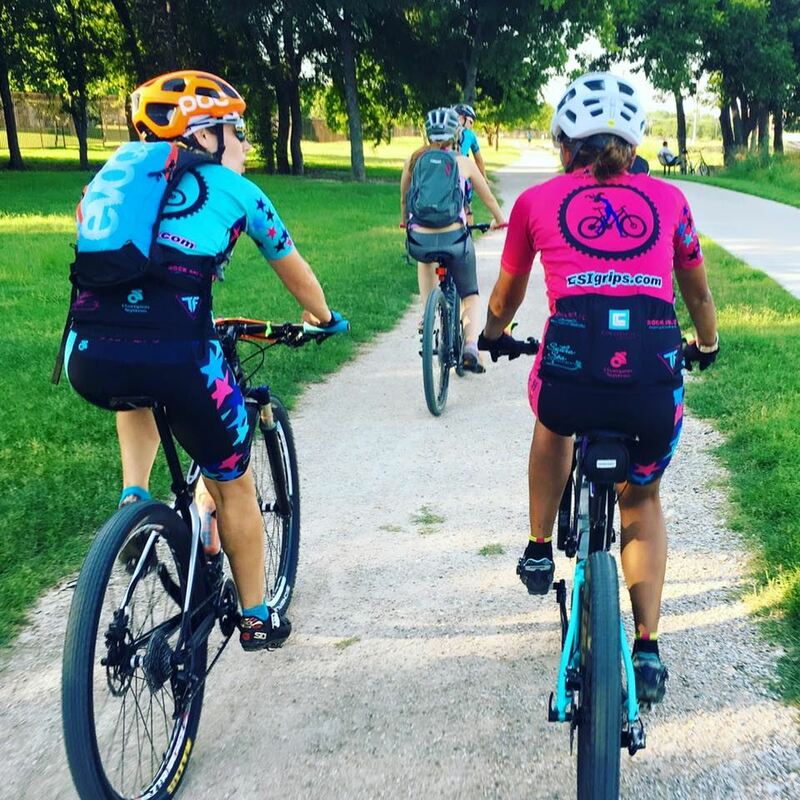 What do I need to bring to a Dirt Side Sisters weekly group ride? It is important to have a mountain bike that is in good working order. If you haven't ridden your bike in several months, it is recommended to take your bike to a local bike shop for a quick tune up. Additionally, you will need some other basic cycling equipment which you should never ride without: helmet, water (bottle or hydration pack), multi-tool, items to fix a flat tire (tire levers, tube, pump), and cycling gloves. Optional items: Knee pads/elbow pads, energy bar or energy gels, electrolytes, clipless pedals/cycling shoes. Always come with determination and a positive attitude! Why do we make name plates for our bikes? Some of us are very visual people and name plates help all of us to learn each other's names. The most important reason we use name plates is because your emergency information is written on the back. This gives us quick access to the correct people in case of an emergency. But since we're all about FUN, we have tons of colors and stickers for you to make yours as bright and unique as you'd like! What is the average length of your rides? Generally our rides last anywhere from 1-2 hrs and 6-12 miles. However, if you get out on the trail and find that you can't go any further, one of our ride leaders/sweepers will take you safely back to the parking lot. I am new to mountain biking and can't ride very fast, can I still ride with the Dirt Side Sisters? Absolutely!! We have a group JUST for women like you. Our rides are always broken up into groups based on skill level. Everyone is patient with one another and no rider shall be left behind! Do I have to be a paying member to ride with the group? Not at all! We encourage ladies to come out and ride with us at any time. If you like what you see/hear/feel, then we would love for you to be apart of our sisterhood! In order for us to keep our rides and events organized and safe for our ladies, there are essentials that can become very costly, such as event insurance, maintaining a membership website, administrative fees, business expenses, snacks and drinks for events, tools and equipment for trial obstacles, and more. Each week of riding with Dirt Side Sisters, you will begin to see what each of these are. We will focus on body position and operations of controls first. Without learning these two skills first, we simply can’t improve on direction control, pressure control, and timing. Body position of neutral and ready- i.e. Level pedals, covering brakes, looking forward, bent knees, bent elbows and chin over stem. Operation of controls will help with choosing the right gear and cadence, and how and when to use the brakes. Trail scanning/terrain awareness will teach how to look where we are going and where we want to go and if we should change the riding position to a “ready” position versus a “neutral” position or just riding along approach. Direction control will teach how using our bodies and bike will help in loose corners, berm turns and switchbacks. Pressure control is weighting and unweighting the bike, the pressure you apply with your body into the bike. i.e peek/push, pumping etc. Timing and coordination aids in putting all the skills into place to allow the smooth efficient transitions over obstacles and through tight turns and applying the right pressure for brakes at the proper time. After a good solid foundation of skills, you will be more confident on the bike and will be ready for the maneuvers that come with trail riding. Maneuvers include cornering, wheel lifts, rear wheel lifts, bunny hops and drops. Why do we need to learn those? Logs, bridges with step-ups or drops, rock gardens, steep downs and ups. Skills will get us there and ready for the maneuver it takes to make it happen. See ya on the dirt side!